Yesterday, the great American poet, Mary Oliver died, at age 83. Her poetry grew out of a love for nature, that served as a refuge from a turbulent childhood. In the woods and ponds around her rural Ohio home, she found beauty, healing and hope. Throughout her adult life, she found wisdom and renewal on daily walks along the beaches and forests of Provincetown, Cape Cod. Nature fed and expanded her soul. 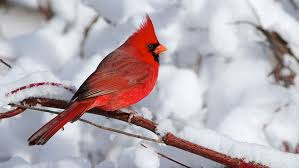 Her poem Red Bird, invites the reader to look for the gift of color that breaks into the often grey and cold days of a New England winter. Red Bird reminds us that beauty however fleeting, comes into even the darkest of times. May Red Bird speak to you. So hungry and so many. Not all of them bold in spirit.